Hellboy: Boy, this is one hellish reboot! Here’s a conversation that would never happen. In this world – where there’s a rebooted Hellboy with a new actor under the horns (Stranger Things’ David Harbour) - the absence of the writer-director who brought Mike Mignola’s mordant comic book character creatively to life twice in the ‘00s means finding ways to distract us from his absence. An R-rating, for starters. With the precedent of the billion-dollar box office for Deadpool, this Hellboy, directed by veteran producer Neil Marshall (Dog Soldiers, The Descent), drops its first F-bomb in the movie’s first sentence. Before it’s done, we’ll meet a crone-ish witch who feasts off a meat locker of dead children, and see people torn apart in various ways by giants, trolls, pig-creatures, and unnamed monsters from a frantically busy CG creature shop. It’s as if, every time the audience starts to remember just how bad a movie this Hellboy is, they throw another monster at us, start another fight, or gross us out with entrails. It never takes a breath, except to introduce a new character, who may or may not be killed in the next minute, or whose role in the movie goes unresolved. It’s a lazy lot of noise. A reboot that doesn’t ignore its obligation to retell an origin story, Hellboy tells us early how its infernal protagonist was delivered from Hell as an infant by the Nazis as a secret weapon, to be rescued and raised with a moral compass and sawed-off horns by Professor Broom (Ian McShane) of the Bureau of Paranormal Research and Defence. But there’s a laughable second origin story offered by the end as well. Our boy from Hell’s fate is destined to entwine with that of an evil medieval witch named Nimue, a.k.a. The Blood Queen (Milla Jovovich), who was dismembered by King Arthur himself, but brought back to life for the purposes of Armageddon by the mere act of reattaching her various body parts. 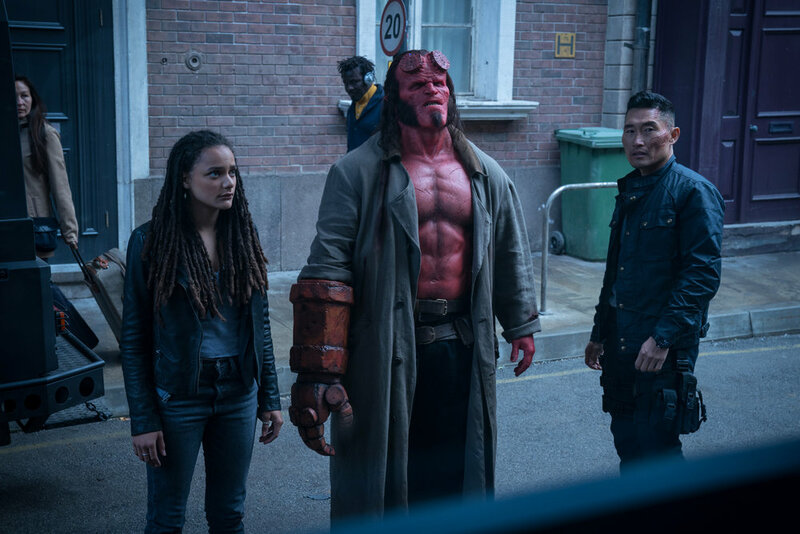 Aided by Alice (Sasha Lane), a young woman with the psychic ability to puke ghosts from her mouth, and his heroic best friend Major Ben (Daniel Dae Kim), Hellboy tosses lame bon mots about “losing your head” and “Didn’t your mother tell you not to play with dead things,” as the blood pours. Being on the set design crew on this mess must have put a lot of people off their feed. A minor plot-point in Hellboy involves Changelings, the faux infants left by fairies when they kidnap people’s children. It’s appropriate. This Hellboy looks like the real Hellboy, but its heart and soul have gone AWOL. Hellboy. Directed by Neil Marshall. Starring David Harbour, Milla Jovovich and Ian McShane. Opens wide, Thursday, April 11.